But hiring a carpet cleaner is expensive. If you want to save significantly on carpet cleaning, here are the questions you need to answer before deciding on a solution. In order to determine how much professional carpet cleaning costs, experts first need to know what kind of carpet covers the floors of your home. Different types of carpet require different cleaning methods, and some carpet varieties are harder to clean. There’s another important factor that can affect the cost of carpet cleaning – the fibers, or types of loops, your carpet is made of. These loops determine how thick and fluffy your carpet is. If your carpet features tight loops, dirt is likely to be trapped deep into the fibers and will be hard to clean. Loose and medium loops also trap dirt, but it’s easier to remove. Talk with a carpet cleaning professional about your specific type of carpet. A professional can help you determine how tricky your carpet will be to clean, and if there’s any action you can take to help cut down on dirt buildup over time. They can offer advice to help you maintain your carpet better and longer, saving you money on regular cleanings. Additionally, the cost of carpet cleaning can increase if your carpet features particularly hard-to-clean messes. Stains, whether from pets and their messes or regular spills around the house, require special spot treatment, cleaning supplies, and sometimes additional equipment. If you’re able to spot clean stains before hiring a professional carpet cleaner, you could save significantly. Search online for effective carpet stain removal treatments – you can find solutions that make everything from grape juice to wine to mud to pet messes easy to clean. By removing the toughest stains beforehand, you’ll slash the price you have to pay for a professional cleaning. What Type of Cleaning Do You Want? Once you’ve determined your carpet type and worked to clean up any big stains that could cost you extra, it’s time to decide which kind of carpet cleaning you need. There are two cleaning methods used by professionals, steam cleaning and dry cleaning. Steam cleaning is the most popular method of carpet cleaning, HomeAdvisor² reports. When your carpet is steam cleaned, a mixture of hot water and chemical cleaning agents are pressure-sprayed into the carpet. This process loosens dirt and debris. A machine is then used to suction up that dirt and debris, and your carpet will dry over the next 24 hours. On average, steam cleaning costs between $100 and $500 depending on the square footage of your carpet. Dry cleaning is truly “dry” alternative to steam cleaning. The dry cleaning method uses just a small bit of water mixed with cleaning chemicals to get your carpet clean – the mixture is sprayed onto the carpet to loosen dirt and immediately vacuumed up by the same machine. The carpet doesn’t need time to dry and you can walk on your carpet immediately after cleaning. Unfortunately, dry cleaning has a downside: it isn’t as effective as steam cleaning because it can’t reach into the deepest layers of carpet. If your carpet is in need of a good, deep cleaning, don’t try to tackle the job yourself. When carpet gets dirty over years and years of use, it becomes increasingly harder to get it truly clean. Fortunately, hiring a carpet cleaning professional can get it done for you. And you don’t have to pay a lot to clean your carpet. Affordable carpet cleaning experts are available, and there are likely plenty of options in your area. 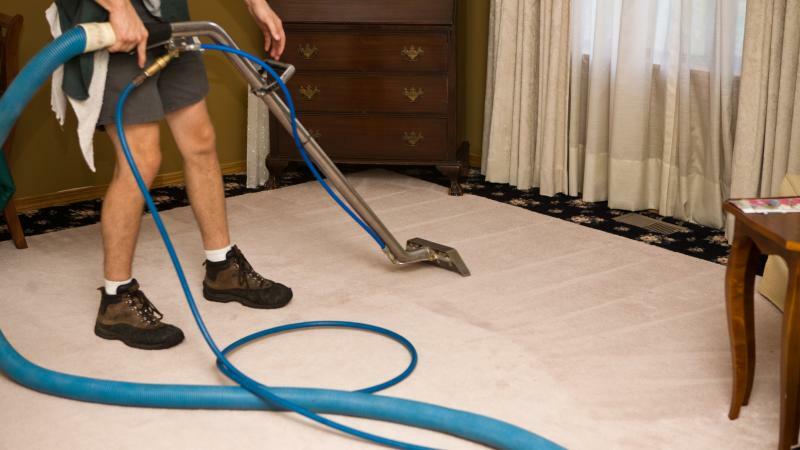 To find the right carpet cleaning professionals at the right price, search online. You’ll discover all of the carpet cleaning companies in your city, and you’ll be able to do your research, comparing prices, cleaning methods, and customer reviews. 1 HomeAdvisor, How Much Does Professional Carpet Cleaning Cost? 2 HomeAdvisor, How Much Does Professional Carpet Cleaning Cost?